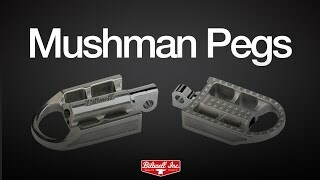 Details: The design and proportions of our Mushman Moto Pegs takes inspiration from high-tech cast titanium units on modern MX machines. These things remind me of the bmx peddles I had on my bike when I was a kid. Except they won't spin around and hit you in the shin. Great stuff as usual from Biltwell. Awesome footpegs. Easy install, look great. Awesome pegs for an FXR, solid and grippy. Very pleased! Solid, well made. I'm a pretty big guy and these look like they'll hold up. Easy to install and adjustable. Recommended! I love these pegs. They def. knock the socks off of the H-D pegs that were on the bike. Only complaint I have is the fact that the left side peg angles a bit too far forward when the peg is pushed all the way down. Will prob. add a little metal to the clevis to keep the peg from going so far forward. As far as feel, these are amazing and the look is BFA! Get them!